Google had been testing a new feature that would allow Contacts users to send money via Google Pay Send for several months. However, the new option hasn't been made available to Contacts users until recently. Although Google has yet to make any announcements, it looks like some Android users discovered the new feature is available and ready to use. A brand new “Send” icon has been implemented to the Contacts app, but that seems to have been added after a server-side update, not via Google Play Store. For the time being, there's no option to Request money, you can just send money to any of your contacts, even though the app's teardown from last year suggested Contacts will allow users to request money, not just send them. 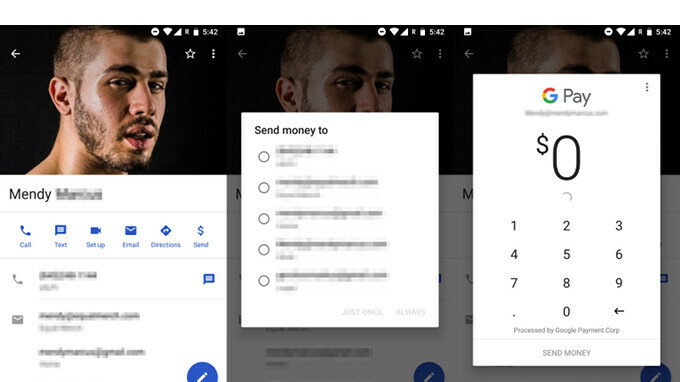 It's unclear if this is just a partial roll-out of the feature, but if you don't have the ability to send money via Google Pay Send yet, expect to get it very soon. Tomorrow's headline. "Google Contact user's money stolen by hackers." It already has been possible to send money using Google wallet for years. How many times did a headline say hackers stole money using Google Wallet?